Static on a Phone Line can be Fixed or Prevented! Because a telephone line always has DC voltage on it, with AC audio riding on top of it, if there's a bad connection of any kind anywhere along the line you'll hear static. Connections on a phone line have to be perfect! Just twisting two wires together may look like a good connection, but oxidation eventually develops on the surface of the wires where they're touching each other, which adds resistance to the connection. On a telephone line with DC voltage, you'll hear that resistance as static. 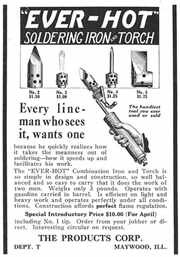 The first splices to telephone wires were done with a big soldering iron that was heated with a gas torch (it wasn't electric). 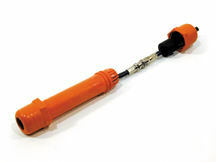 Big electric Black Beauty Soldering Irons were used on solder frames on PBXs through the 80's. Why did the phone men go through all that effort to solder the wires instead of just twisting them together? Because they had to avoid static, and that was the only way to do it. Maybe you twisted the wires together on your stereo speakers, and they work fine? There's no static. That's because there's no DC coming out of an amplifier going to speakers. It's strictly AC audio. When the oxidation develops on the speaker wires that you twisted together, the resistance that eventually develops from the oxidation makes the speaker volume sound a little lower - so you just turn up the volume on the stereo. Since there's no DC, there's no static on the speakers. Likewise, you can use wirenuts on 110VAC or speaker lines, but they're eventually going to cause static if you use them on a telephone line. On a telephone line, you can also get static from a short from one or both sides of the line to a foreign voltage or ground. The foreign voltage or ground may be because water has invaded the cable. Water conducts electricity, and is shorting the telephone line to conductors in another pair(s), or to earth. The static may also be caused by a nick in the insulation, shorting the bare copper wire to other conductors or earth (ground). Intermittent static is often caused by aerial lines that have nicks in the insulation. When they swing in the wind, the bare copper wire shorts to other conductors or pole hardware. These are called Swingers. While you may be able to tape up a wire with a nick in the insulation to prevent it from shorting, in the telephone business it's more common to cut out the bad piece of cable, and splice the ends together, or splice a good piece in if the cable wouldn't be long enough. If it's a buried cable, you need to use gel filled (waterproof) splices, and put the whole splice in a Waterproof Splice Enclosure, which keeps water from getting into the cable from the open ends (where the jacket has been cut). No matter how much tape you use, it won't be enough to prevent water from eventually seeping into that splice! Use a Splice Enclosure. 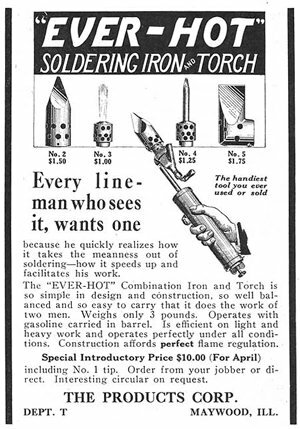 So Why Aren't We Still Soldering Telephone Wires? Insulation Displacement Connectors are simply squeezed onto a wire. They have a little slit that cuts into the insulation (displaces it) and slices into the copper wire as it's pushed into it. There are lots of different types of IDC connectors, including the 66 Block, CAT5 and CAT6 jacks, Krone and 110 Blocks, and even regular Modular Plugs. There was actually one type of splice connector that came out before IDC connectors. The Beanie or B-Wire Connector was the splice of choice at all of the phone companies for many years. The Beanie is just a little metal tube that's big enough to stick about three 24 gauge telephone wires into, with a vinyl insulating jacket. The tube has lots of little sharp points in it that slice into the insulation and the wire, creating a GAS TIGHT CONNECTION. The Gas Tight Connection is the secret of making a good splice. When the metal in the splice is pushed into the wire so tightly that no air can get to where the metals meet, no oxidation can occur - and you'll never get static from that splice. 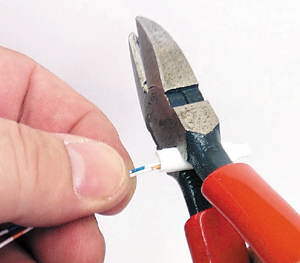 A pin sticking into a copper wire won't give you a Gas Tight Connection. That pin would be sitting on-top of the solid copper wire, and a layer of oxidation would eventually form (unless there was constant hard pressure on the pin). The Gas Tight Connection is formed when the material used in the splice actually slices into the sides of the copper. The pressure created by the small U shaped slot, that the wire is forced into, creates the Gas Tight Connection. If you hear static at the Phone Company demarc, with the pair to the premise open, the Phone Company will have to fix the static. The only way to get rid of static is to repair the bad connection. There are no filters that will get rid of static, since by the time you hear it - it's just audio. If you filter out enough of the audio spectrum to get rid of the static, you'll also get rid of the speech! Sealant Filled - It's Messy! Red Handled Top Quality Side Cutters with 22 & 24 Gauge Stripping Notches! Yellow Handled Top Quality Long Nose with 24 Gauge Strip Notch and Wire Cutter!